Bobby Keen (middle) and Tom Seng (right) field questions from emcee Paula Jarrett about their roles in establishing Leadership Hancock County in 1996. Both men urged the board of directors to innovatively seek new ways to foster leadership in our communities. Leadership graduates spanning a generation celebrated the organization’s 20th anniversary on Tuesday, June 7, with an evening of fun and fellowship. The centerpiece of the anniversary celebration were the members of Leadership Hancock County’s first class, in 1996, who were in attendance. But the occasion was also an opportunity to reflect on the organization’s history and its path into the future. A total of 363 people have gone through the Leadership Hancock County program. Bobby Keen and Tom Seng, two founders of the program who recounted its early days during an interview on stage with emcee Paula Jarrett (class of 2003), told the 100 or so guests that innovation will be vital to the organization’s success going forward. Keen added that today’s divisive political and social climate also demands that gifted leaders come to the fore. That must start in local communities everywhere with programs such as Leadership Hancock County, he said. Steve Jones, the incoming president of the board, acknowledged the importance of strengthening Leadership Hancock County’s presence. His goals, he told the crowd, include building a strong social media presence, reinvigorating the organization’s website and increasing LHC’s geographic reach. The community also can expect an ongoing appraisal of LHC’s curriculum, he said. 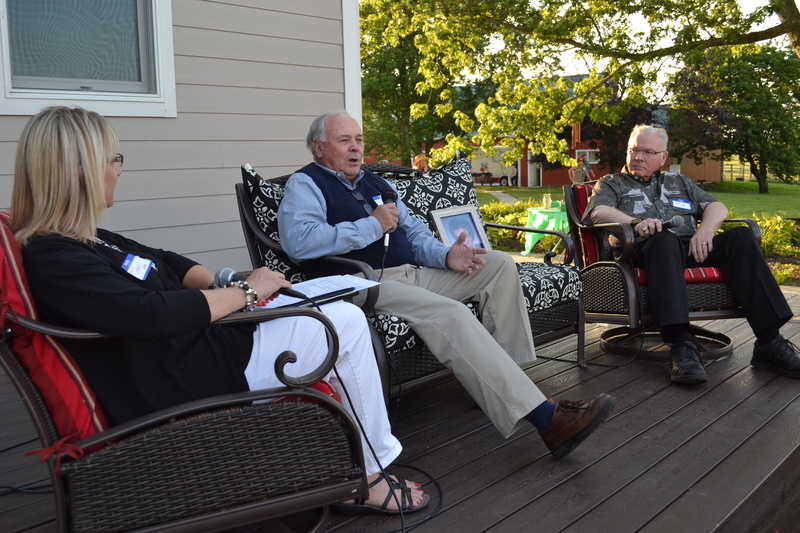 Four members of LHC’s first class attended the event: Debbie Bruce, Robert Harold, Don Watson and Joe Fitzgerald. Marcia Parker, one of the original board members who also served as the organization’s executive director in its early years, also attended. Focus also fell on more recent graduates. Kari Sisk, a graduate of the 2016 class who could not attend the graduation ceremony because of the birth of her son, received the Stacia Alyea Excellence in Leadership award that was announced at graduation in May. Presenting the award was the 2015 winner of the honor, Keely Butrum. The event, which was held at Tyner Pond Farm, also recognized the service of Donieta Ross, who left her job in June as coordinator of Leadership Hancock County. She had been coordinator for 12 years. Bobby Campbell, immediate past president of LHC, praised Ross as a devoted and tireless advocate for the program.